A superb casting with all elements finely and descriptively finished including the extensive display of attributes and hand-chased jewels, feathers and hair, all harmoniously realized and interrelated. Not a single detail front or back has been left undone or unconsidered. 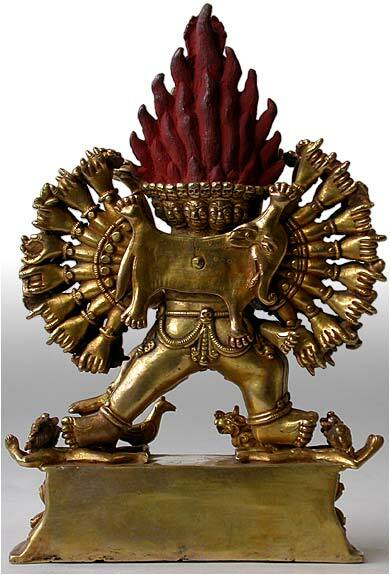 This dazzling bronze displays the 34-armed, 16-legged form of Yamantaka, Conqueror Of Death. He has nine heads, the principal one of a bull with long pointed horns, the other eight mounted on the back of his crown which is ornamented with skulls. His red hair stands on end "with scorpion-sting shaped tips." His mouth is open to reveal fangs and a lolling tongue seeking blood and other tastes. 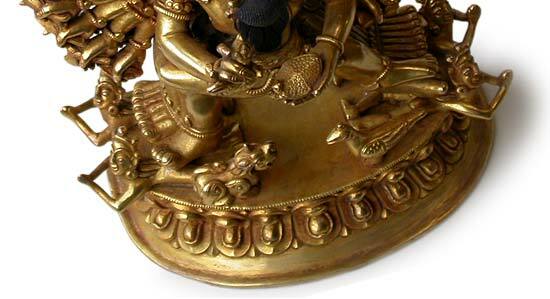 The eyes are large and protruding, a third eye located at the center of the forehead. The eyebrows are angrily knitted and raised. 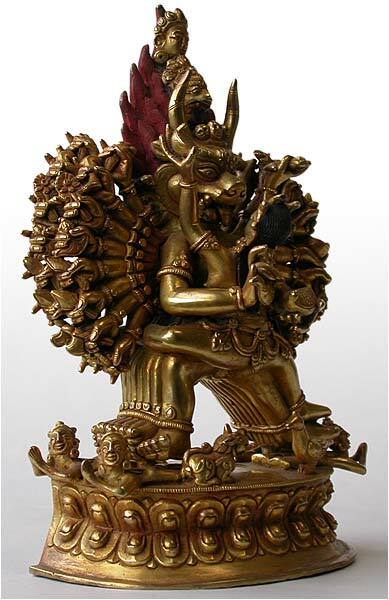 At the apex of the crown above the head of a garuda is a peaceful head of the Bodhisattva Manjusri, of whom Yamantaka is the ferocious emanation. The central main hands hold a chopping-knife and human skull-bowl. 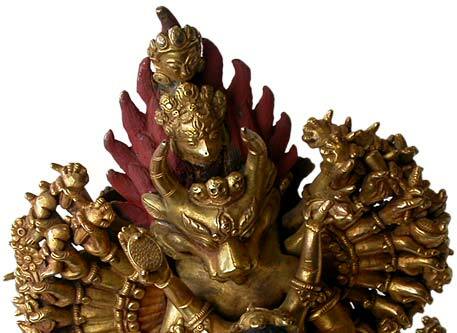 The other hands hold pairs of knives and axes, ritual bells, human feet, daggers with handles in the shape of vajras, tiger’s paws, freshly severed heads, menacing pointing fingers and so on. Across the back of the figure is fastened a cape made of the skin of an elephant. 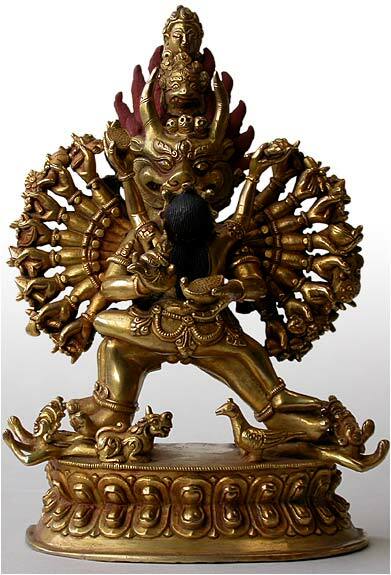 The deity wears an elaborate jeweled girdle of skulls, anklets and other Dharmapala ornaments and surmounts a double lotus base. The identical layers of legs and arms achieve a kind of hallucinatory animation with all the legs in the alidhasana posture, a pose taken from classical Indian dance. 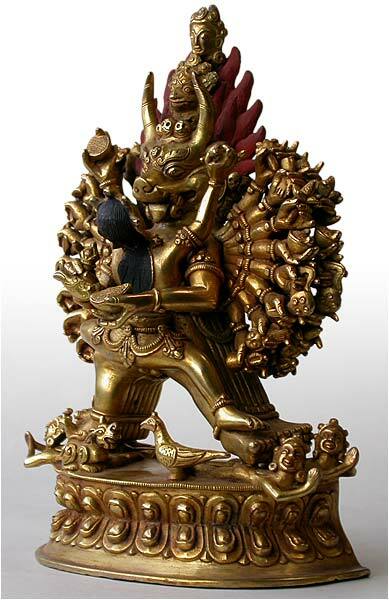 Yamantaka and his consort, who holds the skull bowl and chopper, together stand on the backs of four small figures of subjugated deities. With the poison-transmuting peacock and the wisdom-perfecting snow lion, they comprise the "four ancient classes of beings" (birds, animals, humans and gods). 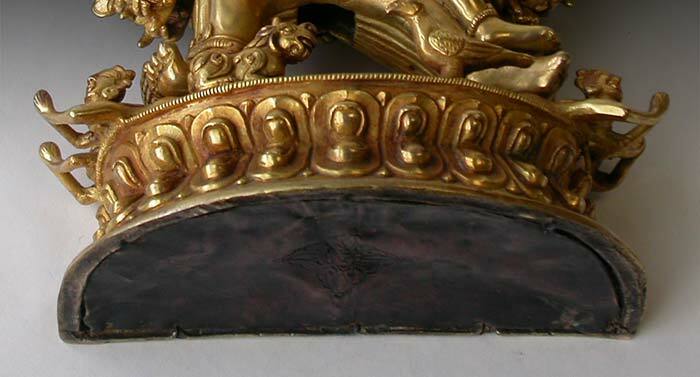 The work is sealed at the bottom, indicating that a ceremony was held to invite the deity into the statue, whereupon it was sealed and engraved with a double dorje.